We're proud to help corporations and consumers meet their sustainability and environmental goals with our products. Keeping lead-acid batteries operating far past traditional life cycles and out of waste stream, landfills and smelters, where they can result in long lasting legacies harmful to the environment if improperly recycled, is a challenge for fleet managers and individual consumers looking for green solutions. Our Pulse Technology is a US patented and scientifically validated process which has proven to prevent premature battery death and extend battery life up to five times their normal cycle. 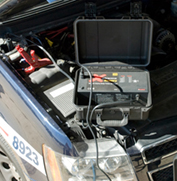 Our Recovery Chargers also utilize Pulse Technology allowing them to recover more than 70% of batteries previously thought dead or useless. This allows batteries to continue to perform in peak condition instead of being considered hazardous waste and sent to recycle centers. The batteries in the image to the left were thought to be dead and were left outside for over a year. Note the visible white sulfate crystals on many of the batteries. However, 85% of these batteries were recovered with the SC-12 Heavy-Duty 12-Station Battery Recover Charger and put back into service. Even with routine maintenance lead-acid batteries will eventually need to be recycled, an energy intensive procedure of sorting batteries into chemistries, including lead, which is a very valuable material. The materials, according to the Basel Convention, have been classified as hazardous waste. It's estimated that batteries in vehicles on the road worldwide contain more than 4 million tons of lead. A substantial quantity of lead production comes from recycled batteries—a profitable and sometimes deadly business. 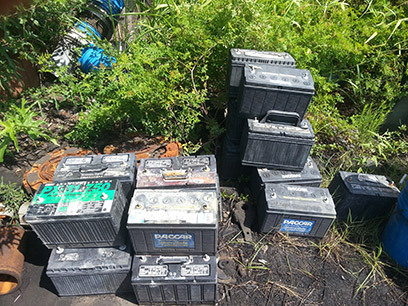 We salute those recyclers that continuously seek improvement in extracting lead from batteries, while adhering to safety standards in processing. We also fully support companies that employ lead-acid battery management programs keeping hundreds of thousands of batteries in service for longer periods of time and away from hazardous waste recycling centers.